Why I purchased the Salomon Q90 skis. In the past I have just gone with the flow and hired my skis, but now I’m at a skill level to know what I want ‘performance wise’ from a set of skis! At first the shear amount of choice was overwhelming but after reading reviews and watching videos I chose the Q90 2014 model; mainly for its all mountain performance and being aimed at intermediate to advanced level riders. I class myself at an intermediate level, consequently, these skis will be suitable as my skills progress. After picking the Q90 skis I wanted a binding suited to a mix of riding styles. The best one available at the time was the Marker Griffon 13, which is geared towards the ‘freeride’ market! This binding not only looks amazing but has the performance to match. My recent trip to Les Arc 1800 was the first time I tested these bindings and all I can say is amazing, they didn’t ejected when riding hard and no matter how much snow built up on my boots or skis these always engaged correctly unlike previous bindings I’ve used. Marker Griffon 13 ski binding. Next seasons Marker Griffon 13 ID bindings recently achieved the ISPO Segment Award for its compatibility with not just alpine but touring boots too which just shows the quality and advancement Marker has made in the past few years! So what is ISPO you ask? Now back to the skis! The Salomon Q90 is a fantastic all mountain ski its full wood core made it extremely responsive on piste and helped to reduce chatter at high speeds giving me the confidence to push myself further. Due to the wide design of this ski I thought the skis would struggle on piste when it came to carving, but no, it handled short and long carve turns extremely well; probably due to the integrated ‘carve zones’ which increases power and edge grip along the traditional cambered section. Unfortunately most of the off Piste was tracked and therefore only got to ride powder in a few places where it floated effortlessly due to the wide tip and tail. Overall this whole set up is perfect for those wanting to explore new terrain giving the option for a mix of both on and off piste when the conditions are there. I give both the Q90 and Marker Griffon 13 five stars! Here at Tallington Lakes Pro Shop we stock a range of the Q83, Q85, Q98 and other Salomon skis; so why not pop down to the shop or look online and view these skis in more detail! So what is ISPO you might be asking yourself. Basically it’s an international exhibition displaying some of the world’s most exclusive and innovative sporting goods. It all started way back in 1970 with the first exhibition of its type opening its doors on March 8th with 816 exhibitors from 25 countries covering a huge 45,000 square meter space. Over the three day event 10,777 industry professionals visited catching the attention of both the events management and world media. 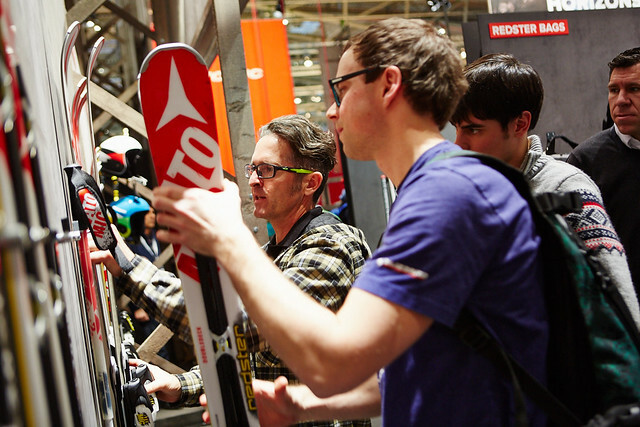 The latest ski products on show at ISPO! The event grew year on year and 2010 saw the 70th event and ISPO’s 40th birthday which had a record breaking 175,000 square meters of exhibition space fully booked! So if you’re interested in reading about the most innovative products for next season, click here. Finally remember to save the date February 5-8 2017 for the next ISPO exhibition!